The need: making two steel boilers each with 136 copper fire tubes (that is, 544 tube ends expanded). I decided to do some inquiring, and asked Graham Chadbone if he knew of anyone with a tube expander. He thought of Colin Booth, done so I rang Colin who was very obliging. He offered to take an expander the next club day so that I could have a look at it and photograph it. Thank you, Colin. You should note that all these photos have been taken in the used condition - after it had expanded more than 550 tube ends destined for two full size reproductions of a Stanley Steam Car being made by Eric Schliff. 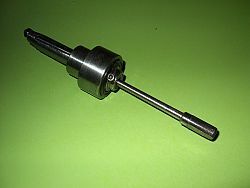 The bearing body, the roller body and the roller body nut are straight turning jobs. 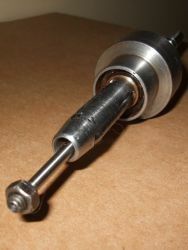 For the making of the taper drive spindle and the rollers I used the same taper that was on Colin's larger expander. My tube size was 5/8" and the wall thickness was 0.048". The tube plates were reamed to 0.630" so 1 knew that I had a minimum of 0.529" and a maximum of 0.534". I made my expander to cover this range plus a bit. 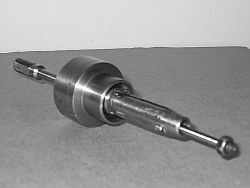 I found I had to make a small spring loaded centre and a small live centre before I could grind the rollers and main spindle. 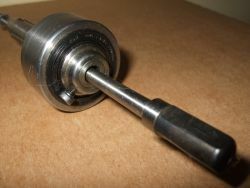 Next job was to harden the rollers and the spindle. 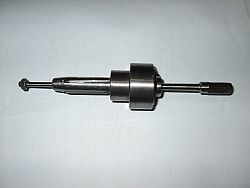 The long spindle was difficult to keep straight when hardening. 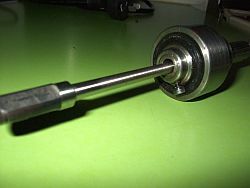 I ground the rollers without a drive dog, but found I had to use one with the main spindle. The grinding was done with a tool post grinder I made years ago. 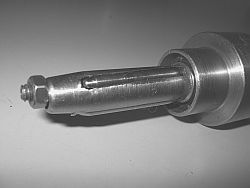 When milling slots in the main body for the rollers, first mill slots at 21/2°, and then use a dovetailed cutter to machine clearance for rollers. I used an old slot drill which I ground into a fly cutter and then finished the slots off with the Dremel and files. I cut all tubes 6 mm longer than outside measurement of tube plates, then flared one end to 45°, and fitted all tubes to the boiler. The next job was to use the expander on the ends with the 45° flare. I put the tool into my battery drill (14.5V Bosch). I was very surprised to find how easy it was to use. It pulled itself in, and when you think it's enough expanding, you put the drill into reverse, and the job is done. It didn't take long for me to find out that you have to keep things clean and well oiled. 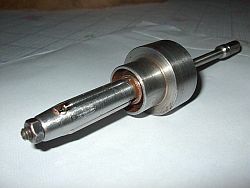 I did approximately four ends, and then I would clean the tool in turps, then oil using heavy grade oil (steam oil). After 544 ends I was ready to give up. I found I should have put more time into hardening the long spindle. It was well worn when I had finished. Both boilers tested okay with only one end of one tube needing another touch with the expander. Author: Eric Schliff & Graham Chadbone. This article first appeared in the MELSA Maryborough Newsletter in the June & December 2009 issues and is used with permission. 90 Text and photos Copyright © 2006-2019 SMEX, All rights reserved.